Making desserts to please the entire family does not have to mean sacrificing time or money. With some prior planning, you can whip up a alternative to ice cream that uses real fruit. To add decadence to this dessert without making it too sinful, a spoonful of sweetened condensed milk is poured on top, giving this dessert the flavor of peaches and cream in a chilly treat that is perfect for cooling off with on the hottest summer days. 1. Place both cans of peach slices in the freezer overnight or until frozen solid. 2. Open both ends of each of the frozen can of peaches with a can opener and empty the contents into a food processor’s work bowl. 3. Add the extract and 1/4 cup fat free sweetened condensed milk. 4. Pulse the mixture several times until it becomes smooth. Add more milk if needed. 5. 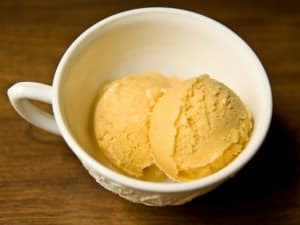 Serve the sherbet in individual bowls topped with 1 to 2 tablespoons sweetened condensed milk for each serving. This is not actually sorbet since it uses a milk product and not actually healthy since you are using canned peaches in heavy syrup. Wait, where does it mention sorbet? It does say sherbet, but not sorbet. I was going to ask how healthy it could be since you’re using both peaches in heavy syrup and sweetened condensed milk. You might be better off making ice cream with cream and fruit. Like and I LOVE Debra J Mckinnon. !